Low Cost & Downright Cheap All-terrain Tires that Perform! You don’t have to drop a fortune on new all-terrain tires to get good on and off-road traction and long tread-life. Some brands you have likely never heard of make excellent tires that perform as well as tires that are twice as expensive. Here are our Top 5 picks for low cost all-terrain tires that perform both on and off the road. Trail Guide All-Terrain tires are one of our cheapest all-terrain tires on tires-easy.com, but a best seller because it finds the right balance of rugged looks and on-road performance. All the tread features are designed to provide the aesthetic that truck owners love but without overly impacting the performance of the tire on the road. To do this, Trail Guide Tires use special rubber, technology and design innovations to break the on/off-road performance trade-off. For example, the tread blocks are large, but have reinforcing tie-bars between the individual blocks to stabilize the tread. A stable tread surface is important for any off-road tires for the street. It means more safety and tread-life on pavement because less movement on the surface of the road for a cooler running tire with better handling. Falken Tires has always put an emphasis on great looking treads and sidewall features to grab attention. With the Falken Wildpeak A/T3W tire, we now have low cost all-terrain tires that has the right light truck tire aesthetic but with very good on-road manners. 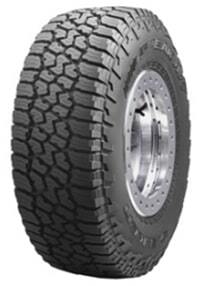 For low cost all-terrain tires, these work exceptionally well in bad weather on paved surfaces. The traction in snow, ice and other winter conditions is due to the 3D Canyon Sipe technology and the longer tread edges of the center blocks. These features do not hurt the performance of the tire in off-road conditions, but make a huge difference on rain soaked or winter roads. The Falken Wildpeak A/T3W tire even has a 55,000-mile warranty which gives you more assurance that these tires will last if maintained, and rotated frequently. 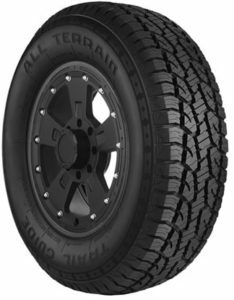 The Milestar Patagonia A/T tire are low cost all-terrain tires that gives reliable all-season traction, with extra focus on winter traction. It has interlocking blocks in the center of the tread for a quiet, comfortable ride on the highway. For biting grip and exceptional traction on all types of terrain, there is the alternating open block design on the outer shoulders. In addition to these tread features, the large, square contact patch means more rubber in contact with the street, which spreads out the weight of the vehicle for longer tread-wear. 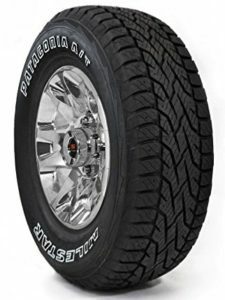 The Milestar Patagonia A/T tires are our cheapest low cost all-terrain tires, but with performance on par with other tires in most situations. The Kanati Trail Hog AT tire has a more aggressive all-terrain tread that many people use in muddy off-road conditions, but it has surprising good on-road performance. It has many of the same features that make other premium tires perform well on paved roads, like the heavily siped and bridged blocks in the center of the tread. These blocks are of varying sizes and arranged in such a way as to make the tire as quiet as possible at all speeds, as well. 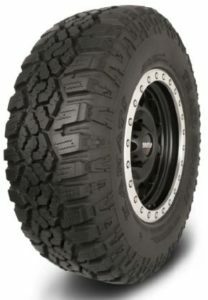 For the off-road tire look, Kanati has molded mud bitters into the upper shoulder of the sidewall which gives the aesthetic that most truck owners desire, even if they rarely venture of the highway or paved city streets. 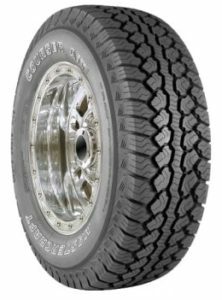 Mastercraft Courser AXT tires are made by Cooper Tires and have many of the design features that are in the more expensive Cooper branded tires. The Mastercraft Courser AXT tire has the rugged all-terrain tire look, but still offers highway drivers an outstanding mileage warranty, excellent traction in all-weather conditions, a quiet and comfortable ride, and even improved fuel economy. Better fuel economy is an attribute not usually associated with low cost all-terrain truck tires. To achieve this, Cooper Tires added special tread rubber compounds and tire construction techniques to reduce the amount of heat and friction generated by the tire when under heavy loads. This can mean up to 2% better fuel economy compared to driving on tires without these features. If you have read this far, you are likely the type of person that is willing to invest some time in learning about the products you buy and finding the best deal. This makes you the ideal candidate for buying tires online. Armed with the exact size and speed rating, (the information for the original tire size for the vehicle is always listed on the plaque on the inside of the driver’s door), you can easily find the best price and type of tire for your driving needs and budget on Tires-easy.com. We have the lowest prices on the internet, and our tires are much less expensive than the tires stocked at national retailers. You can order the tires from the comfort of home on tires-easy.com, and have the tires shipped to your home, or to the nearest installer.